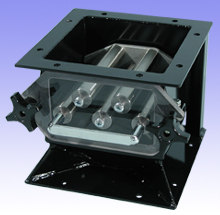 Our Mini-Feeder Drawer Magnet assembly is designed for use with our Mini-Feeders. This magnet has five stainless tubes with ceramic magnets, arranged to make the material flow over and around the magnets for maximum control. The 1/2" Lexan® window is machined with a step that fits into the housing to eliminate the need for a gasket.